Please note: This knowledge paper was written especially for SOL and the copyright is invested in John Marathakis and SOL. Permission is granted for individuals to take one hard copy of this article for personal use. Electronic copying or storage is strictly forbidden, as is the posting on other websites. As a young and eager student of occultism, I tried to master many different divinatory systems at once. Unfortunately (but inevitably), I became so confused, that I stopped studying them for many years. However, this superficial knowledge of many different systems led me after a while to the conclusion that the most interesting aspect of their study (for me at least) is the way they divide the Whole in all its component parts (I cannot possibly imagine, for example, a divinatory system that has no symbols for joys and foretells but only sorrows, or the opposite). Then, I thought about the correspondences between them, and I found them to be many and considerable. Of course, I do not claim to be an expert on this subject, nor that my conclusions are the “correct ones”. This article is nothing more but an attempt to present some ideas that seem to be reasonable. First of all, the I Ching divides and explains the Universe by the 64 hexagrams. Each of these consists of six simple unbroken or broken lines, one above the other, in every possible combination. The unbroken line is said to symbolize the Active Principle (Yang), while the broken one symbolizes the Passive one (Yin). Every hexagram consists of two trigrams, one above the other (in every possible combination again). These trigrams are eight in total (thus 8×8=64), and usually we find them forming a circle around the Chinese symbol T’ai Chi. Judging from their number the eight Trigrams (and the 64 Hexagrams) might well symbolize subdivisions of the four elements. But I couldn’t continue my syllogism in order to find their elemental attributions. Similarly, the western Geomancy divides the Whole in sixteen geomantic signs. A multiple of four again, but this is reasonable enough since Geomancy uses the same philosophy with the I Ching: Four levels (instead of six) composed by one or two points (instead of lines), in every possible combination. Cornelius Agrippa and Gerard of Cremona attribute these sixteen signs to the 12 Signs of the Zodiac. Note that four of the Zodiacal Signs are repeated, in order to fit the 16 Geomantic signs, and also that Gerard’s attributions do not agree with Agrippa’s. As a matter of fact, even the Latin edition of Agrippa’s “Occult Philosophy” does not agree with the English one, nor does his “Fourth Book” with any of the aforementioned. Agrippa also attributes the geomantic signs to the seven planets, the Caput and the Cauda Draconis (two signs for each planet, one for the Caput and one for the Cauda), and these later became the “official” attributions of the Golden Dawn. But I had a strong feeling that geomantic signs simply do not fit with astrology, at least on this level, and that the different number of signs is indicative enough to this conclusion. I thought that these peculiar signs have to do with subdivisions of the elements, as well as the I Ching symbols. The Golden Dawn offered an additional elemental attribution, but it offers little help because it is based on Agrippa’s astrological system and not on the signs themselves. As a result, in this system we have five fiery signs and only three airy. 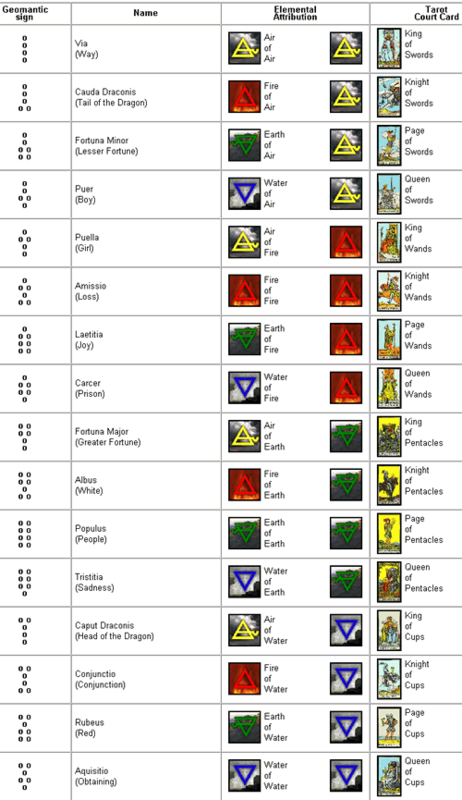 The court cards of the Tarot deck are also sixteen in number, and their elemental and sub-elemental attributions are more or less obvious and generally known. Aleister Crowley worked hard to attribute the Tarot cards to the geomantic signs and the I Ching hexagrams, but it is simply impossible to fit the sixty-four hexagrams into the fifty-six lesser cards and court cards. He takes four of the trigrams as the elements (the other four being the Sun, the Moon, the Lingam and the Yoni), and by their combination he forms the attributions of the court cards. But although he follows this system as regards the court cards, it becomes a matter of taste when he examines the lesser ones. As regards the geomantic signs, he corresponds them to some of the lesser cards according to their Zodiacal Sign and the Governor of their Decan (only five or six of them can be attributed in this way). So, once again I couldn’t continue my syllogism in order to find some valid attributions. Now the Tattwas is one of the Indian ways of the World’s division. They have an obvious elemental connection, but they are five in number, thus making the attribution difficult. Their symbols are: Akasa, Spirit: A black or indigo oval. Vayu, Air: A blue or green circle. Tejas, Fire: A red equilateral triangle pointing upwards. Apas, Water: A silver or white crescent with its horns pointing upwards. And finally, Prithivi, Earth: A yellow or golden square. Except for the primary or simple Tattwas there are also combined forms of them, with the secondary Tattwa being a smaller shape within the primary one. Thus, for example, when we want to picture Air of Earth we draw a blue circle in the midst of a yellow square. A complete set of Tattwas consists of twenty-five symbols. And for a third time I couldn’t continue my syllogism. Connecting the spots (as the medieval geomancers did), we see various shapes. The qualities of Fire form a symbol that is the same in Alchemy and the Tattwas: An equilateral triangle pointing upwards. The Earth symbol is obviously Prithivi, a square. The qualities of Water form a triangle pointing downwards (the Alchemical symbol for Water) and this may well be the primal form of the Tattwic symbol Apas. Finally, the symbol for Air, which has no angles, may with some imagination create the circle of Vayu. Okay, I would say to anyone who would present this interpretation to me, but this is pure coincidence. Why did you place the Cold-Heat line above the Dryness-Moisture one? Because, he (and I) would admit, it was the only combination that made sense. And this is by no means a proof. But let us see what happens if we apply the same interpretation to the I Ching trigrams. Observe that the only disharmony in their meaning is the attribution of the Wind to the Active Water, and of the Lake to the Passive Air, as if there has been an interchange. But I think that all the other attributions verify this idea. Moreover, this explains the fact that while the fiery (or the earthy) trigrams are next to each other, the watery ones are apart from each other in the traditional correspondence. By means of the aforementioned principles, one can explore the elemental worlds with satisfactory precision. For example, we can, symbolize the Active Water of Water simply by adding a single point under the Aquisitio, or even form a western geomantic system of the 64 sub-subdivisions of the elements, just like the I Ching. And why not form a system of 256 sub-sub-subdivisions (if you feel comfortable with a symbol that consists of eight levels of points!)? The Golden Dawn used such an elaborate system, based on the Elemental or Enochian Pyramids. Or one can find relations to other divinatory systems, the Gypsy Rune Stones for example. And a final word about the Ogdoad and the Ennead: Each time I see the I Ching trigrams cited around the T’ai Chi symbol, my mind goes to the Gnostic Ogdoad (the Eight Prime Aeons around the Forefather), and the ancient Egyptian Enneads (companies of nine gods, usually made up by four pairs of deities and one supreme god). Moreover, in ancient Egyptian tombs four gods and four goddesses are watching the dead. Could it be that the Archangels of the four quarters can be regarded as pairs with the Four Holy Creatures, thus representing the active and the passive principles of the four elements in Qabbalistic Magic? I Ching, or Book of Changes (translated by Richard Wilhelm and rendered into English by Cary F. Baynes), Penguin Publications, 1989. Cornelius Agrippa, Three Books of Occult Philosophy (edited and annotated by Donald Tyson), Llewellyn Publications, 1997. Israel Regardie, The Golden Dawn, Llewellyn Publications, 1995. Aleister Crowley, 777, Level Press. Aleister Crowley, The Book of Thoth, Weiser, 1985.